There’s usually chaos before the calm of a superyacht launch — or relaunch. 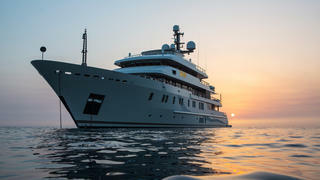 The planks, tarpaulins, the entrails of electrical systems, dusty contractors wedged under and behind things; no matter how many times you see the endgame of a superyacht project, it seems inconceivable that they’ll pull it off in time. 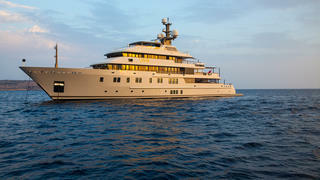 Polar Star, moored up at MB92 in Barcelona, was a maelstrom of activity in November. 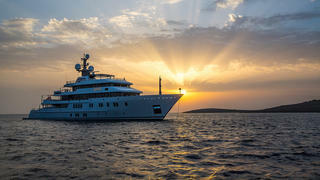 Built in 2005 and bought by her current owner in 2007, she had a thorough refit in 2015 and was back at the Spanish yard for some warranty work and edits to the sauna, before heading to the Caribbean. It is a testament to those behind this extraordinary project that Polar Star met her deadline. But then this is a team adept at recognising the changes that will make the biggest difference using the lightest touch. The total project time was nine months; the interior team FM Architettura d’Interni, which fabricates most of its products from scratch, had just seven. “Our approach is cosmetic,” says Francesca Muzio, co-founder of the company. “We don’t modify the structure because, if you start with a very intensive, aggressive approach, it costs money and time.” And she should know, having spent 10 years as design director of CRN. Luckily they had an Espen Øino-designed, well-maintained Lürssen to work with, so there weren’t many worries on the structural side. The biggest edits to the guts of Polar Star were the electrics, electronics, audiovisual, plumbing and exhausts. Changes to the structure were mostly limited to exterior areas. The contemporary layout was fine as it was. But the country house-style décor needed a total rethink. 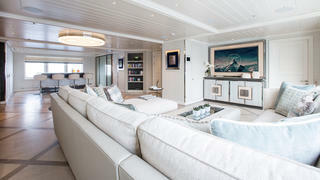 The guiding principles from Muzio were “cleaner, purer, softer” and — fittingly for an explorer yacht — the owners requested a design that was more in tune with the ocean environment. 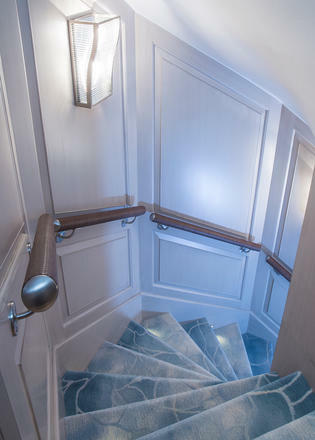 The most literal examples of this are the stairwell carpets, designed and made by FM Architettura d’Interni, and rippled and coloured to resemble the Caribbean Sea, and the hand-stitched leather handrails that blend in with the beach club atmosphere on board Polar Star. 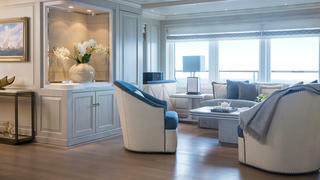 But the colour palette throughout Polar Star is a delicate silver grey, with aquamarine and bronze accents. The yellow tone of the varnished oak panelling has been muted and cooled with a bleach wash, while wallpapers by Venetian company Rubelli have a subtle silvery shimmer. The deeper aim of the revamp was to streamline Polar Star’s interior, making it more usable and, as Muzio notes, “increasing the perception of the volume”. The main saloon is a case in point. Heavy floor-length curtains (which also featured on other levels) used to block out the edges of the window frames, even when drawn. These have been replaced with cream blinds that make the most of what the massive windows have to offer. Even when closed for privacy, the blinds’ semi-translucent composition floods the space with light. Rugs have also gone, revealing new grey parquet that makes the space lighter and seem wider. A large round of squashy taupe sofas to starboard has been replaced with a more structured white version. Pale blue scatter cushions pick up the tone of a spectacular central mosaic designed by FM Architettura d’Interni and built by DG Mosaic, which draws the eye all the more for the simplification of its surroundings. 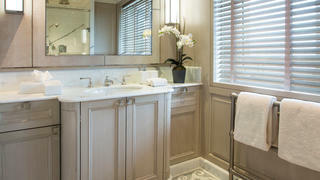 In front of the seating area is a glamorous cabinet in shagreen with custom-made marble mosaic handles. It stores audiovisual equipment and above it is a 65-inch cinema screen, while to port a secondary seating area has been replaced with a smart bar. 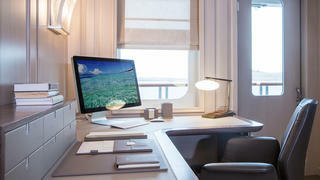 Forward, a seldom-used superyacht office has become a massage room with backlit furniture and a practical vinyl floor. The area has been transformed from one where you could sit or work, to one in which you can lounge, watch a film, socialise at the bar or have a massage. 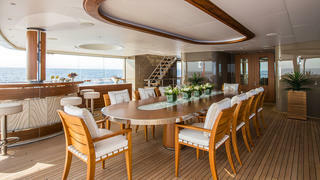 The owner’s deck saloon has a more glamorous edge, thanks to etched mirror-front cabinets that gleam in daylight or the glow from the marble fireplace. And thought has gone into a few smaller edits. To aft, for example, the corners of two cabinets blocked the view from seating areas to the windows. These were scooped out to create recessed plinths — spaces for flower arrangements that free up sightlines and maximise light flow. Not a team to miss a decorative opportunity, that partition is covered in leather cut and moulded with a flower motif. They removed a bath to create two equal-sized shower rooms and made a little office to starboard in the cabin. 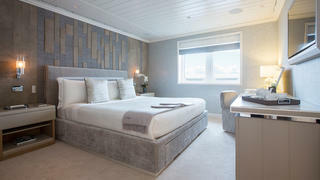 The main deck guest cabins now have their own decorative leather headboards and muted wallpapers, and while most marble in the en suites has been retained — “it was pointless taking something out that was good,” says Van Wyk — fittings were updated and the only bathroom was made a shower room so that all four cabin facilities matched. The crew layout on board Polar Star was already voluminous and functional, so the cabins just needed new door panels and curtains. 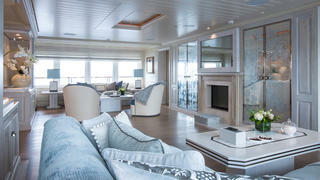 The superyacht wheelhouse had more of a revamp. “All new screens. All the radars have been redone, new gyros, all new controls,” lists Van Wyk. 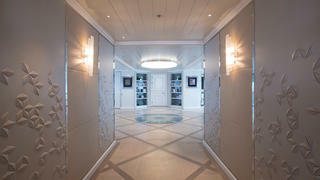 At the aft end of the bridge deck is a superyacht gym, which got new flooring and a storage rethink. “Before, things were stowed in different areas, it wasn’t built-in and then you’ve got heavy items rolling around. Now it’s really practical and they use it,” says Van Wyk. Out on the bridge aft deck, the exterior edits begin, as notable for what was preserved as much as for what was changed from Polar Star’s previous incarnation. 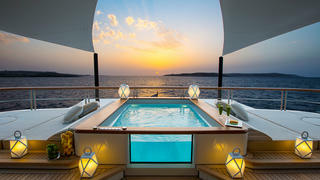 Replacing the hexagonal superyacht spa pool with a contemporary square allows space for large sunpads either side. The only obstacles were the round skylights in the deck where these would sit — so they created sunpads with holes in them. They still function as skylights but the cushion holes can also be used as ice bucket holders. “And we made a round cushion that we could put in if they want to close it up,” says Van Wyk. They also added two types of bar — one for chin-ups and one for drinking. The new sauna is just inside a door from here — the capacity did not change but the original was replaced by a modern version built by Klafs. Forward, up broad central stairs from the platform, the main deck aft used to be primarily for tender storage. Now there is a neat round of seating, with the tenders shielded behind wooden louvres. “So they have a sauna, then they can take an aperitif here,” says Muzio. 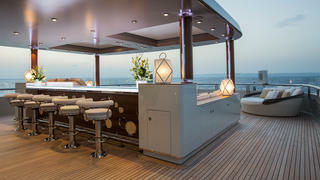 But the superyacht sundeck is the most dramatically transformed exterior space. The design team removed the hatch that used to provide access to the deck from the central internal staircase and made the external side staircase the main point of entry. That was a weight difference small enough to balance out by losing weight elsewhere, for example all the furniture up top is carbon, too. But it wasn’t just the hardtop — which opens up “like a car roof” to give light when desired. 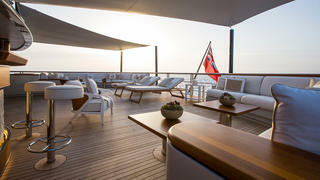 Essentially the whole sundeck was remade because, as Muzio puts it, the owner never went up there. 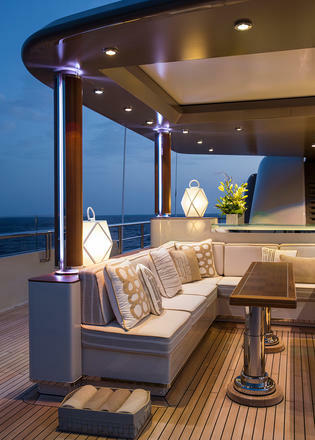 Forward, beneath the hardtop, is a long bar, fronted with what Muzio calls “bubble glass”, designed by FM Architettura d’Interni and built by the project’s exterior carpenter Vedder, and lit from beneath. On the other side of this, the area is split between a broad sunpad space for lounging and a seating area with two long tables that can be converted into dining tables. 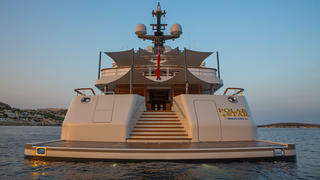 In terms of Polar Star’s exterior look, the dark blue hull has been replaced by a muted light brown. “We couldn’t quite find the right brown,” says Muzio, “the ones in the catalogue were too brown or too yellow or too red.” Then they came across a flowerpot that was just the right shade, and they sent it to Pinmar and Awlgrip, who reproduced the colour exactly. So now the yacht is finished, how does the owner feel about her? He initially asked Muzio to pen the interior so he could sell Polar Star complete with redesign drawings. But he liked the ideas so much that he decided to do the refit himself. And he likes the result so much that he’s keeping Polar Star for private use. 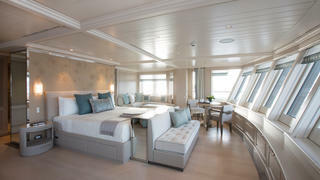 “There is no greater feeling than sitting on the refreshed sundeck at night, watching a film by starlight for example, or retiring to the improved owner’s cabin to relax and enjoy a renewed sense of space, peace and the panoramic views,” he says. 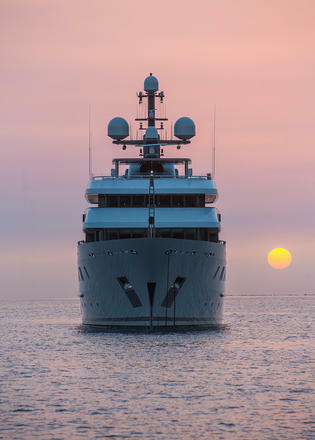 It’s certainly a swift change of plans, but it’s hardly a surprise from a superyacht refit project that was all about maximum impact in minimum time.